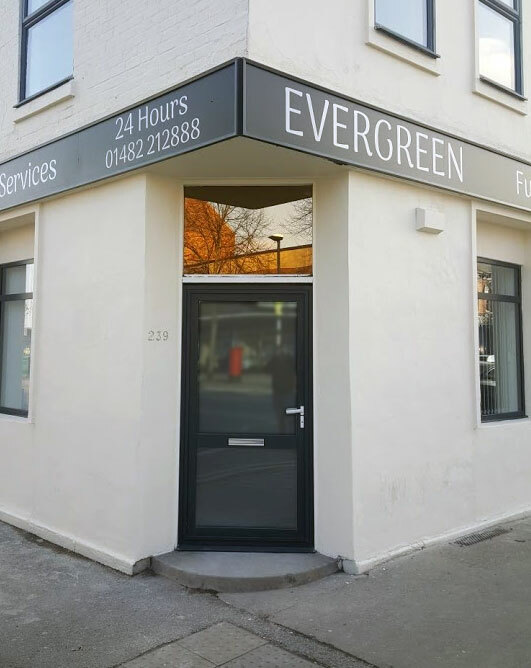 Evergreen Funeral Services are an independent, family run business with 14 years’ experience in the funeral industry. Looking after families is what we are here for; understanding their needs and offering them all of the advice and support we can at one of the most difficult times they will ever face. We try to keep things clear and simple and we really take the time to get to know our clients. Because we are independent we have the ability to offer a more personalised service and we never push our families into making any decisions that they may not want. Our core values are what we pride ourselves on. We offer clear, affordable prices without any compromise on our service. Whether you’re planning a big send off or something small and simple, our commitment of dignity and respect to your loved one remains the same throughout. If you have had a bereavement and would like to talk to someone about funeral arrangements please call us on 01482 212888, we are available 24 hours a day. From the moment your loved one comes into our care, we will treat them with the utmost dignity and respect that we believe everybody deserves. We will listen and help you understand the options available to you but the details are your decision. We will honour your beliefs or traditions and do our best to fulfil your wishes. We understand that death affects everybody differently and we will give you all of the time that you need. We are always here for a chat, reminiscence or even just a cup of tea. We offer a number of options to suit every budget, with costs that are clear and explained to you without all of the jargon. We are a small, family run business who will dedicate our time to you. You will get to know us personally and see the same, familiar faces when you come to see us. We understand that every person is unique and we like to be able to get to know your loved one so that even the smallest touches can be personal and meaningful.